I should first mention that I have no fond childhood memories of Little Tokyo. In fact, I have no childhood memories of Little Tokyo, because I grew up in Cleveland, Ohio. But there was moment in my life when I realized that I was "homeless" or missing a sense of ethnic community. So I drove out to Los Angeles in my 1983 Toyota with all my worldly possessions to accept a job with a non-profit organization in Little Tokyo. That was over twelve years ago, and I'm still here. My first realization of being in Little Tokyo was at the Kimura Photomart. I had some film to develop. (Yes, these were the good old days before digital cameras.) They asked for my name, and I replied, "Wataru Ebihara". This is normally followed by, "What's your name again? Can you spell it? ", and I was fully prepared to repeat my name, but this never happened. Yes, it was my "Ah-ha!" moment that I was truly in "J-Town". I'm a 2.5-generation Japanese American. Growing up as a minority individual, one accepts being the perpetual outsider. But it's sometimes nice to know there's a community where you're not really questioned if you do belong. When lived in Ohio (a place where there's not a whole lot of Asian Americans), I was constantly asked, "Where I was from?" (meaning what's my ethnicity and what country I'm from). This doesn't happen to me in Little Tokyo, and it's actually quite nice. Over the years, Little Tokyo has become my hometown, and I have my community memories. I also met my wife in Little Tokyo, and we even had our wedding at the JACCC in Little Tokyo. I also remember the many shops and restaurants that have now closed down. There are changes taking place in Little Tokyo today with all the new developments -- some are positive changes, but some are changing the character of the ethnic community. Can Little Tokyo remain "Little Tokyo" with Starbucks, Subway, Office Depot, Quiznos, and other mainstream shops converging into its historic core? Fortunately, I can still walk down the street in Little Tokyo on a sunny afternoon, run into a few people that I know, and chat with them for a bit. It's still nice to hear Japanese being spoken at the market or random conversations on the street. And I hope this will continue. Little Tokyo is a small town in the big city. 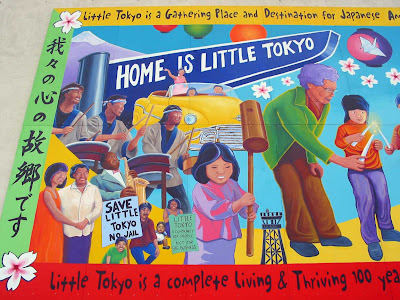 I hope the new residents will also come to learn and appreciate Little Tokyo, and to know it's long and colorful history -- and eventually become part of the Little Tokyo community.